Thank you for your interest in supporting the Raj Soin College of Business! Your generosity is greatly appreciated. The college is grateful for the support and commitment of its alumni, faculty, and friends to ensuring quality education to the region's future business professionals. It is through your gracious efforts that the college is able to succeed in its community mission. Because the competition for fundraising dollars increases each year, your gift to the Raj Soin College of Business is very important. You can let the college decide where to apply your gift, or you can name a specific program, scholarship, or fund you wish to support. 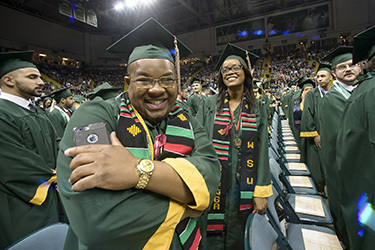 Visit the Giving to Wright State website to learn more about giving options. Please select as many designations as you like from the list and click the Submit button at the bottom of the page to be taken to the Online Giving page to make your donation. For all programming (including scholarships, faculty research, marketing, etc.) related to the Institute of Innovation and Entrepreneurship (IIE). This fund was established for general support for the RSCOB MBA program. This fund was established for the Dean's office expenses. This scholarship is for Raj Soin College of Business students. This scholarship provides financial aid to students majoring in accountancy. This fund is awarded and used in the areas of greatest need, at the discretion of the Chairman of Accountancy. This scholarship is for students who have been admitted into the Department of Accountancy. This scholarship is for financial need students majoring in Accountancy who have public accounting in their career plans. This scholarship is established to recognize outstanding accounting majors who have expressed an interest in pursuing a career in public accounting. For the use of the Accountancy Department. Decisions on expenditures will be made by the chair of the department in concert with Deloitte & Touche. This scholarship is for undergraduate or graduate students in Accountancy. This scholarship is for Accountancy students who have demonstrated leadership and a commitment to a career in professional services. This scholarship is established to give financial assistance and encouragement to deserving students who intend to pursue a career in accounting. This scholarship is for meritorious full-time, undergraduate Accountancy majors. This scholarship is for Accountancy majors with high academic achievment and leadership abilities. This scholarship is for undergraduate Accountancy students. To support undergraduate Accountancy major students who have reached junior or senior status at the time the scholarship is issued. Additionally, students need to meet the current GPA and financial need criteria for the WSU Mission Scholarship. See Agreement. To promote the advancement of governmental accounting education and encourage students to pursue governmental accounting professions. The Pohlman & Talmage Endowed Scholarship will be available to academically qualified students who are majoring or intend to major in Accountancy. Annual Scholarship for Accounting and Finance Students. Scholarship for accounting major and 60 semester hours completed (junior level student) at the time the scholarship would be paid. Minimum of $1,000 for recipient. Scholarship to support Accountancy students. This scholarship was established to provide scholarships for students that have financial need, be a junior or senior Accounting major with an overall GPA of 3.0. To provide financial support for students majoring in Accountancy at the Raj Soin College of Business. This fund was established to provide financial support to students in the Department of Accountancy and demonstrated academic achievements. This scholarship is for Accounting majors with preference being given to non-traditional female students. This scholarship is for Accountancy majors who have attained a minimum gpa of 3.0 and have financial need. This fund supports the Department of Economics. This scholarship is for Economics majors. To fund scholarships for Economic majors. This scholarship is for students, who are majoring in Finance or Financial Services and have obtained a 3.0 gpa. Funding to support students and alumni who are studying for the chartered financial analysts exam. This scholarship is for full-time students majoring in the Raj Soin College of Business. Preference will be given to Finance or Financial Services majors. This scholarship is for a non-traditional finance or financial services female student with a minimum gpa of 3.0. This scholarship is for Finance Club members. Recipients may be either full-time or part-time continuing students. This scholarship supports Finance majors. This fund was established to provide funds for any expenditures related to the MTC Technologies Trading Center. This scholarship is for Finance or Financial Services majors. This scholarship is for Finance or Financial Services majors who have attained a minimum gpa of 3.0. First preference will go to students with financial need. $1,000 annual scholarship for Financial Services students with a 3.0 GPA or higher who demonstrate financial need. This scholarship is for Finance majors who have earned a minimum gpa of 2.5. This scholarship is for Financial Services majors. This fund was established to provide operating support of Wright Financial Path-student to student debt counseling program. Support Supply Chain majors. To support students majoring in Information Systems and Supply Chain Mgt. Dept. in RSCOB. Support Supply Chain majors with priority for minority students. Support Supply Chain major with the highest GPA. Support Information Systems and Supply Chain student activities and faculty development. Support Information System majors and Supply Chain majors with high GPA and industry engagement. General scholarship funds for Information Systems and Supply Chain majors. Expenses in support of student experiential learning and the teaching thereof, which include, and are not limited to, student and faculty travel mileage, software, and research expenditures that are necessary for conduction and completing student projects in both information systems and supply chain programs. Support logistics and supply chain executive events and activities. This fund was established to fund the logistics and supply chain management executive program fund. To elevate the Center for Career Management, including but not limited to, career management workshops, graduate student assistantship funds, physical space for effective interviews, dashboard display, scholarships, etc. � See Agreement. To be used for the construction of the coffee cafe in Rike Hall. This scholarship is for Management/International Business students with preference for students concentrating in Project Management. This scholarship is for students who are majoring in a Management-related field. This fund supports the Human Resource Development program in the College of Business. To fund the Human Resource Lecture Series. This scholarship is for Management/International Business students. This fund was created to be used at the discretion of the Chairman of the Management Department. This fund provides financial support to emerging priorities within the Marketing Customer Insight Program, including but not limited to: curriculum development, seminars/case studies, speaker forums, and mentoring program. This scholarship is for Marketing majors with an emphasis in customer insight who have obtained a 3.0 gpa . This fund was established to provide students the opportunity to work during the summer months or during the academic year at local businesses. Student will receive a stipend, through WSU's student payroll process, for one academic quarter under this agreement. Recipient must be a full time student pursuing a marketing degree and be in good standing. This scholarship is for undergraduate or graduate Marketing majors. This scholarship is for Raj Soin College of Business marketing students with a minimum gpa of 3.25 and who have the intent of going into retail business. This fund was established to support the marketing department initiatives and activities. This fund was created to be used for student and faculty development of the Department of Marketing. This scholarship supports the students majoring in marketing. To provide scholarship support to student(s) within the Marketing Customer Insight Program in the Raj Soin College of Business. This fund was established to provide funding for Department of Marketing graduate students who have demonstrated an ongoing enthusiasm for the positive application of marketing to problem solution to help offset the cost of tuition, fees and required textbooks. This fund was established to support students in the College of Business. To support students in the RSCoB serving on the Dean's Student Advisory Board to help with emerging priorities. To support students in the ReyRey Café student management board to travel internationally to source of origin with Boston Stoker leadership to experience how direct trade business operates and experience first hand how supply chain works for Boston Stoker. Uses of the award may include, but are not limited to, airfare, accommodations, meal expenses, etc. This fund was established to support distinguished speakers. This fund was established in honor of George M. Walker, retired VP and CFO from Robbins and Myers for faculty development (including seminars, travel). This fund supports Institute for Business Integrity activities. Bank One established this grant as an annual award in 1992 for minority students. This fund was established for administrative and initial expenses for the Ohio Business Hall of Fame. To support purchase of books, and travel reimbursement for outside speakers. To support the PBI: established in 2013, a multi-day residential experience that will expose incoming 11th and 12th grade students to the disciplines of economics, accounting, marketing, finance, management, and information systems management and help spark their entrepreneurial spirit. Through real-world business simulation, students will have the opportunity to learn about a local business/entrepreneurs through critical thinking scenarios, research, and collaboration. Funds contributed will be used to support this program (such as scholarships, operating costs, marketing, etc.). To invest in faculty development that elevates RSCOB,including but not limited to, additional research funds, graduate student assistantship funds, faculty presentation travel funds, and emerging priorities. For operating expenses of the Small Business Development Center. This fund was established to provide budget support to the center's stock market simulation program. This fund was established to send student representatives to regional competition and other expenses associated with SIFE. The HF and ME Hopf Fund will be available to qualified students who are majoring in an area within the Raj Soin College of Business. To provide scholarship support to student(s) within the Raj Soin College of Business. This scholarship is for junior or senior level Management majors who have demonstrated leadership in academic or extra curricular activities. The fund was established to support students enrolled in the Raj Soin College of Business. This scholarship has a first preference for Catholic Central High School graduates who plan to major in any Business field. Scholarship to support incoming students into the Raj Soin College of Business with a first preference given to students marjoring in marketing. To support an accomplished student majoring in the Department of Accountancy at WSU. See agreement. This scholarship is for Greene County High School graduates who have been admitted to the Raj Soin College of Business. Available to any major in the college, must have a 3.0 high school GPA and is renewable to graduation. Must maintain a 3.0. This scholarship is for African American undergraduate students with financial need majoring in a business field. This scholarship is for International Business majors. Fifth Third Bank renamed this scholarship in September 2001 to honor board chairman Jerry L. Kirby. This scholarship is for non-traditional, independent, single parent students in the Raj Soin College of Business. This scholarship is for metorius students in the Raj Soin College of Business. Recipients will be involved in the management and the operations of the ReyRey Cafe. These students are typically representative of all majors in RSCOB. This scholarship is for any Business major who has demonstrated financial need. Scholarship for students in the Raj Soin College of Business. This scholarship is for junior or senior students in the Raj Soin College of Business with a minimum gpa of 3.0, and have demonstrated leadership qualities and service to the college, as determined by the committee. Preference is given to students with financial need. This fund was established to provide financial support for seniors majoring in Accounting, Finance or Management. Recipients must be full time undergraduates, have senior status, have a minimum GPA of 3.0 and have financial need. This scholarship is for continuing Raj Soin College of Business students who have obtained a minimum gpa of 3.0. This fund was established in conjunction with the RSCOB and the Young Entrepreneurs Seminar. Finding the right college means finding the right fit. See all that the Raj Soin College of Business has to offer by visiting campus.